Guernsey FC striker Ross Allen says the island side must make the Isthmian League Division One South play-offs as a "minimum" this season. Guernsey finished 10th last season, having made the play-offs in 2014. The team has been together for a month, with the bulk of the squad involved in Guernsey's Island Games gold-medal win. "We're hoping to challenge for the title. 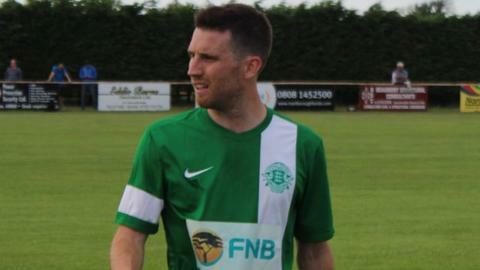 The play-offs is the minimum goal because we know we can survive in this league," Allen told BBC Guernsey. "In the first year we were an unknown team to everyone else and I think we surprised people," he said. "Last year they learnt their lesson. They learnt how to play us and we now know that we've got to change a few things going into this third season because teams are going to have a lot of information on us, and that's just from playing us, let alone from watching the videos. "We've got to adapt, we've got to change things, we just can't go in and be the same old Guernsey FC team that we've been the last four seasons, because we haven't had too much adaptability, and I think this is our big chance to really learn and push for promotion." Last season, Guernsey won just two of their first seven matches and Allen says if they are to go up, they just have a better start in 2015. He continued: "You look at Burgess Hill and Peacehaven (the last two Isthmian League Division One South champions), they intimidated teams by having a good early run and being in a strong position by Christmas. "That's what we've got to try and do - and hope all the other teams fight it out and there's no other single team going for the title and we put our noses in front."